Q – We have been researching various river boat lines and we were wondering what you think of Emerald Waterways. They seem to be legitimate. We are looking for a line we can take to both Europe and France in the next couple of years. We are not drinkers and, to be frank, we are on a budget. So I guess what we are asking for is a recommendation. We like contemporary versus a more traditionally-furnished boat and, if possible, a younger, more energetic crowd (we’re in our late 30’s). Are there several lines that jump out at you or one that seems most appropriate? A – You should definitely have your agent review the offerings of the new “U Cruise” programs on Uniworld. But the line that we think might appeal the most is Emerald. They are a less-expensive division of Scenic, the top-tier Australian river cruise line. Beer and wine is included with meals, some excursions come at an additional cost, and the decor is rather minimalist. But the ships are lovely, sleek and modern, and Emerald Waterways is attracting an interesting mix of younger North Americans and retirees from down under who are on a bit of a budget. 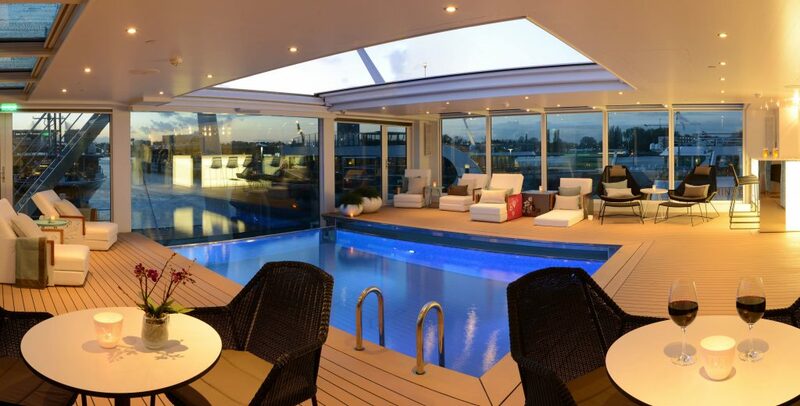 Their boats feature an indoor pool on the upper deck that transforms to a cinema at night. Tips are included and there are enough “C-Bikes” to go around. Emerald is launching the Liberte in Burgundy, the Destiny on the Rhine, and the Radiance on the Duoro. Three new ships, each built specifically to fit through local locks and under bridges en route.